Most people who stumble across this blog likely have at least a passing familiarity with Tolkien’s Middle Earth, whether they’ve only seen the recent Peter Jackson films, read the books, played one of the many Lord of the Rings games, or been dedicated enough to pick up analyses of Tolkien’s work and become moderators on official forums the way my mom has (she’s such a nerd ❤ ). Now, it goes without saying that every fictional society is going to be idealised in some way which will have an incredible amount of influence from the writer’s personal feelings and experiences. The logic which governs a fictional society will always be more straightforward than that which governs a real one. Some aspects will be simplified or glossed over (particularly if they have no direct relevance to the story itself) and others will be detailed down to a ridiculous level of minutiae. With that disclaimer out of the way, let’s consider how the different Middle Earth societies function as depicted in the base reference material. I realise the title of this blog post says “economics”, but society and the function of internal economies are tied very closely together, and you can’t look at one without examining the other. This is more to start a discussion on the subject; I welcome further input and alternate theories! 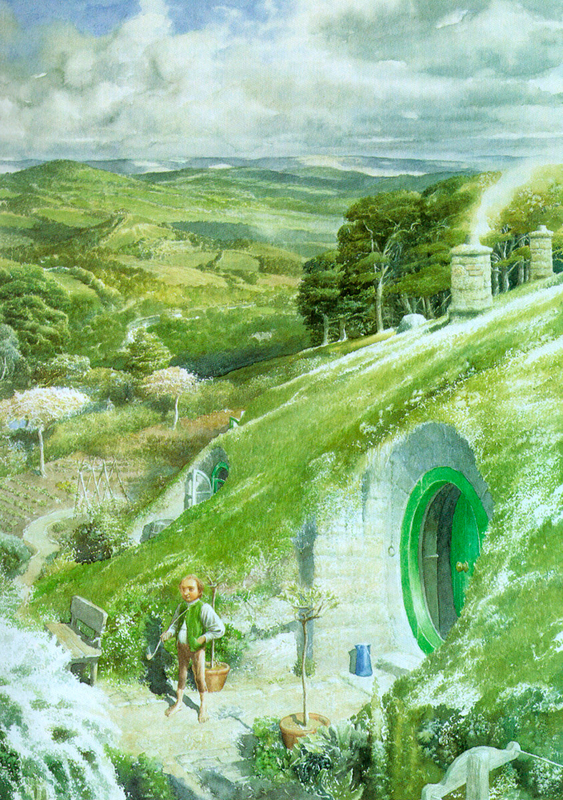 Hobbits are an idealisation of English country folk. While some are obviously more well-off than others, they are not the ones who control the governance of the Shire; each village elects a mayor. Others may not be wealthy, but there are no Hobbits who exist in true poverty — if someone is truly in need, their friends and family members will help provide for them until they’re back on their feet. There’s a strong sense of community and fellowship. Based on existing evidence, I’m going to hazard a guess that there are Hobbits whose specialty is to build Hobbit-holes or -houses, and that these are commissioned by a Hobbit who has obtained permission from the mayor to use a plot of land in or near the village and who then purchases the needed materials and pays the builders for their work in coin, goods, services, or some combination thereof. The society does not seem to be centred around an exchange of coinage for purposes of commerce, although it clearly plays a part; a barter or “favour” system seems far more commonly used (“favour” being an act of kindness performed by one party toward another without expectation of reward, with an answering act of kindness offered at a later date as a way of expressing gratitude rather than out of a sense of obligation). Their society is largely self-sufficient and doesn’t require an exceptional amount of trade to function; however, they would likely be highly amenable to trade, had the rest of the world not quite forgotten they exist! Elves appear to be far more socialist, and I use the term in the literal rather than political sense. While there is a social hierarchy, Elven society appears to function as a collective, where everyone provides according to their skills and receives according to their needs. There doesn’t appear to be any monetary exchange involved between Elves at all; possibly this is Tolkien’s vision of what an ideal society might look like. Whether in Rivendell, Lórien or Mirkwood, Elves live amongst each other rather than in separated properties, which is likely a simple proposition when one’s age spans centuries and one’s existential nature is palpably spiritual and deeply in harmony with the world. The Elves are clearly not farmers — there’s no depiction of land cultivation of any sort, with plants permitted to grow where they will among Elven settlements — yet it is suggested that they feast well, so we can make a guess that some commodities make their way in from outside. There isn’t much the Elves could offer in exchange in terms of coin, but fine elven crafts would likely make their way out of the halls as barter, and safe passage through the woods offered for those willing to make the trip. Dwarven society has a very clearly-defined social hierarchy, with an emphasis on material wealth which leads to numerous parabolical downfalls throughout Dwarven history. One may surmise that there’s not a little racial insanity suggested by Tolkien regarding the Dwarves’ cultural desire to acquire and hoard wealth. There is also a hint of hive-mindedness; not that the dwarves act as an interconnected whole, but that they are in fact very content with their lives and work willingly to maintain the status quo. While this may not lead to a great deal of upward social movement save for particularly successful individuals, there seems to be a sort of reward system based not so much on wealth as it is on emotional or spiritual fulfilment. Trade with outlying nations is absolutely essential, due to a heavy lack of resources underground, and Dwarven traders are a common sight throughout Middle Earth. Poverty exists, but it’s less responsible for susceptibility to darker agencies than are feelings of being cheated out of something that should belong to a particular collective; rather than sedition being seeded by individuals, whole castes and clades act as one. The level of social connection is most clearly demonstrated in the behaviour of Thorin’s Company at Bag End — whilst the Dwarves’ co-opting of Bilbo’s house would be exceptionally rude in Hobbit, Human, and Elven societies, this should be considered quite ordinary behaviour for Dwarves: food is considered free for all who are hungry, whilst the items within the house are the property of the homeowner and are used as needed and then cleaned spotlessly before the company departs. Their behaviour may be rough, but Tolkien takes time to emphasise that nothing is broken despite the rough joking around. 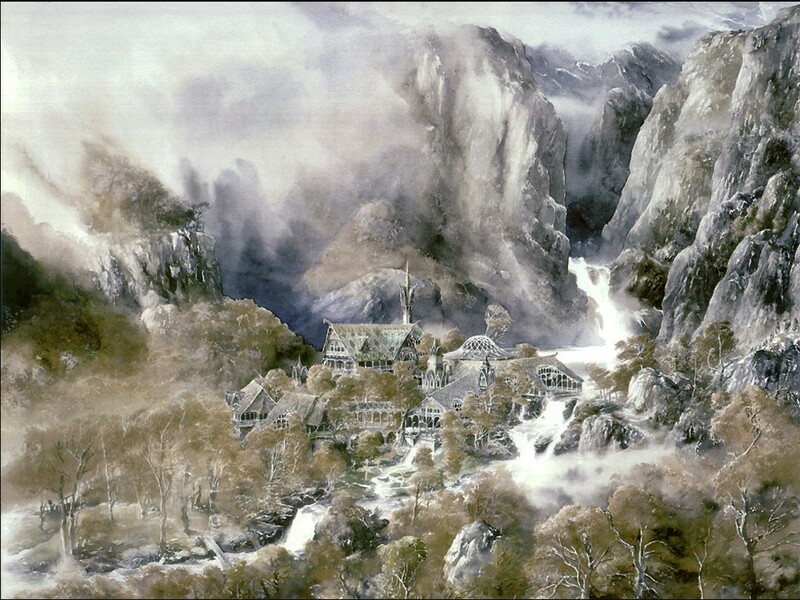 I’d like to put in a side note that I consider the Company’s behaviour in Rivendell in Peter Jackson’s first Hobbit film to be creative license rather than canon, unless Dwarves really would consider breaking up a host’s furniture to build a fire just because they lack respect for the owner. It makes a humourous scene, but it doesn’t seem to fit their character. I certainly can’t see Thorin approving. I’ve left Human society for last because it’s rather more complicated. While Hobbits are largely a localised people and thus have a common social structure (there are some Hobbits, particularly some of the more adventurous Stoors, who travelled much further afar, and have developed a somewhat different way of life when they settled, but even that isn’t much different to the Shire-folk society), and Dwarves and Elves are old races with well-ingrained social patterns regardless of where they have settled (primarily in separated enclaves which are carefully guarded), Human society in Middle Earth varies widely. I’ll drop a theory that this has a lot to do with the lifespan of the individual — when a people as a whole live shorter lives, greater variation can be seen as groups split off and form their own societies. Tolkien seems to imply that longer lifespans lead not to stagnation, but to a quicker attainment of optimal social structures, as individuals have license to engage in trial and error, examine the long-term results, and retain the memory of past errors (unless under the influence of pathological hoarding). If you look at the population of a place like Bree or Laketown, they’re very commerce-oriented. Both are trading waypoints, or started as such, and that has an effect on the way society functions. The mayor is elected — I’m guessing by the leading merchants of the town — but there’s a marked diversity of social classes. As with the Dwarves, poverty makes some susceptible to being bought by darker hands; but avarice has this effect as well. Among Hobbits, avarice leads to acts of selfishness, but not to acts of outright betrayal of the community as a whole. In Bree you get unpleasant characters like Bill Ferny and his brigand friends causing an exceptional amount of mischief on either side of the Baranduin. 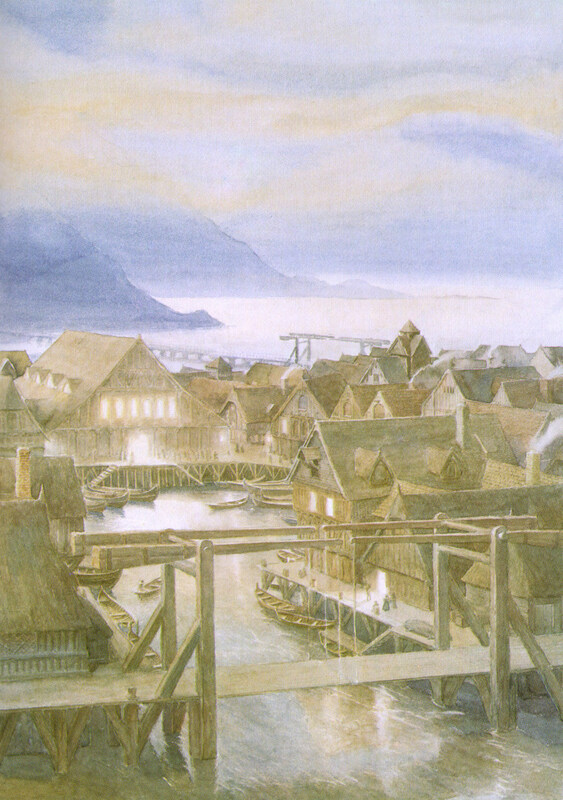 I’m not certain what the fate of Laketown was six decades on from the events of The Hobbit, but it’s not difficult to conceive of certain elements of the society falling under the influence of Sauron or Saruman’s agents as well. Certainly, Sauron would have extended an olive branch to Smaug had the wyrm survived, and from there it’s an easy step to imagine that gold, regardless of its source, would have caught the attention of the more unsavoury elements of Laketown society. Rohan has a more sharply scaled class divide, however the lords of the land appear to be highly accessible by even the lowest common-folk, who are able to petition for judgement in disputes and assistance in times of need. Whilst some villages as a whole are better- or worse-off, this largely depends on their location and level of self-sufficiency; the Rohan people benefit from the region’s fertile grasslands, and maintain gardens within the palisades and outlying farms which owe fealty to the nearest lord. Rohan is not a society built on open exchange, and the nation is far more closed on its borders to outsiders — strangers are expected to declare themselves and their intent to the nearest lord or passing patrol. Tolkien drew heavily on Scandinavian society for his influence, and the result is surprisingly socialist despite having a ruling class. Theft from one citizen is seen as theft from all, and mercy is emphasised in the form of either penance or exile from the community rather than imprisonment or execution. There is a continuous level of strife with the Dunlendings — a more transient, tribal people who inhabited the plains of Rohan long before the horse lords settled; while the majority of Rohan’s citizenry seems to have very little to complain about with regards to their social status, the Dunlendings would very much like their land back, and the more militant among them are happy to accept Saruman’s offer when it arrives. Gondor is rather unique, in that it exists in a constant state of alert, rather a Cold War-level of preparedness with the fume of Mordor visible on the other side of the mountains. One can imagine that in pre-Fourth Age Gondor, there wasn’t so much an active conscription push as there was widespread voluntary service — and the lords would certainly have offered provision for the families of the soldiers in exchange, since contented soldiers are also loyal soldiers. It’s likely that women were far more active in mercantile and artisanal trades in Gondor than they may have been in other Human lands, simply because someone has to do the work and the men are either in the field or training for it. Children appear to have entered training from a very young age — Eomer’s childhood armour, given to Pippin, is likely not an outlier, regardless of his status. 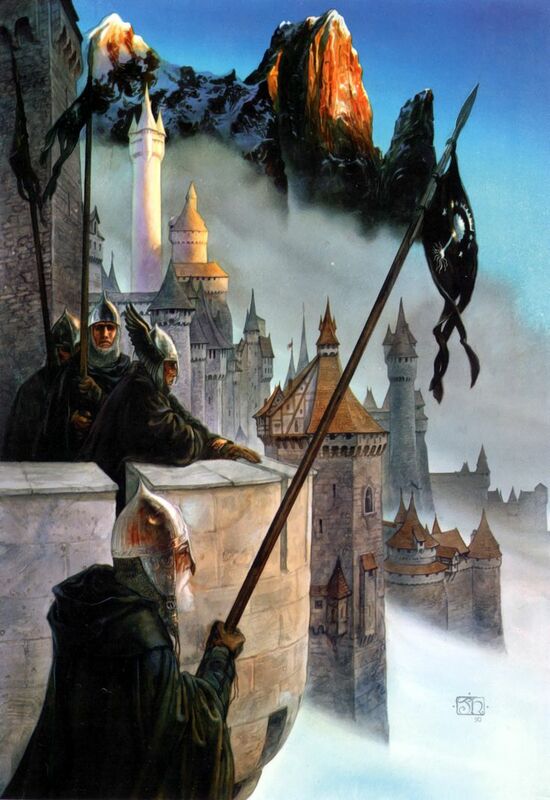 Based on what is known, I’m going to drop a supposition that the Gondor economy was strongly guild-based, and due to women being highly active in the economy of the city, there may even have been the equivalent of a public school system for the children of the lower classes, while upper-class families may have employed private tutors. In most other Human lands, children were most likely educated at home and trained to take on the family trades. I’m going to admit, I’ve not used reference material for this blog post, and I’ve tried very hard to stick primarily to the material of the original books, which is one reason I haven’t mentioned the endemic corruption depicted in the Laketown of the Hobbit films — Tolkien largely glossed over the society there entirely, which isn’t particularly surprising for a story intended for children. Likewise, the gems Thranduil covets in the films are not mentioned in the source material, and I haven’t made reference to them, although I can appreciate why they were added to the film adaptation. There may be details I’ve missed — I haven’t yet finished reading The Silmarillion (please don’t hurt me), and most of my suppositions pay only the barest lip-service to the racial origins and how their closeness to those origins might have further effect on their society and economy. I may even be over-thinking things, but I tend to view the writing process like an iceberg, where the majority of the work done isn’t directly depicted in the final product.